Besides a $55K diamond necklace by Fred Leighton (a crystal replica would do), I’ve thought of another crucial item I desperately need to polish off my boho chic efforts. A vintage chain-link quilted Chanel bag. Preferably in a neutral tone, but I’d probably accept one in any color. Magenta. Periwinkle. Army Green. Like, whatever, seriously. I just need one. Often I find myself attending events where to have a purse in hand or hanging off of one shoulder becomes burdensome. Sometimes, you just need to have both hands free. Unfortunately, going purse free is not an option with which I feel comfortable. I’ve witnessed this phenomenon as displayed by other women. And not just by the more tom-boyish girls, but by ultra fem, pink-wearing, purse-loving girls as well. Ummm…where are they putting their stuff? How do you walk out the door without a purse, and still manage to transport your wallet, keys, and phone? Not to mention other female accoutrement. And let’s not pretend as if this issue can be resolved by the solutions of men. This is a strictly female conundrum. Our jeans do not harbor clandestine vacancies in which we can invisibly store the bare necessities. I still do not completely understand how men manage it. B’s brother Curtis has referred to B’s jeans as “tight britches”, and I would have to agree. How he veils the sharp angles of a phone, wallet, and keys withing the recesses of those tight britches eludes me. However these individuals, be they male or female, manage to accomplish this mysterious task, it shall forever remain for me an insurmountable obstacle. I must have a bag. I can make things fit in a small bag should the situation call for it, but more often than not, you’ll typically observe a bag that appears as if it should weigh 15 lbs. hanging from my shoulder. It’s like a security blanket. But back to the main point. On those particular days when I do not want to carry my 15lb. 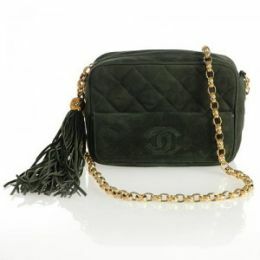 bag, I would love to stuff as many items as possible into an authentic, vintage Chanel bag and sling it over my shoulder messenger-style. That would be bliss.